Also known as rat poisoning… go to any hardware store and look at the back of one of the rat poisoning containers. The main ingredient is sodium fluoride, which is also the same ingredient in a very well-known antidepressant known as Prozac. It was first introduced and given to the Jews during World War II. It was put in their drinking water supply to make them become complacent and docile… in other words it was meant to make them “easier to control.” Oh yeah, don’t forget to check the main active ingredient in your toothpaste before you brush your teeth tonight and check to see if your town supplies fluoride in their public drinking water. You can find out by checking here. Notice how that website will say, "optimal level for the prevention of dental caries" but in reality that level is very dangerous for us to consume over extended periods of time... effects of long-term exposure isn't tested in laboratories, but the dangers are very real... run a search. Known as the High-Frequency Active Aurora Research Project, this huge area is owned by the U.S. government and is built in Alaska. It is used to modify weather among other things, and works alongside with a few other centers that are placed around the world. In other words, if you ever wondered why Hurricane Sandy was the first recorded hurricane to be able to travel in one direction (north) and all of a sudden stop and turn 90 degrees to travel east to hit the East Coast of America… or if you ever wondered why there has been such an unnatural amount of intense earthquakes recently around the world… I wonder what Nikola Tesla would think of how his inventions are being used today. To help you find the truth, watch the documentary titled, "Holes in Heaven? 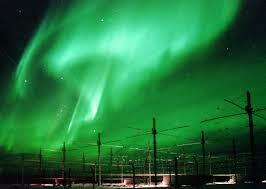 HAARP and Advances in Tesla Technology." Unfortunately, I’m pretty sure you have probably seen this in real life. But what exactly are in those chemtrails that we end up breathing in? 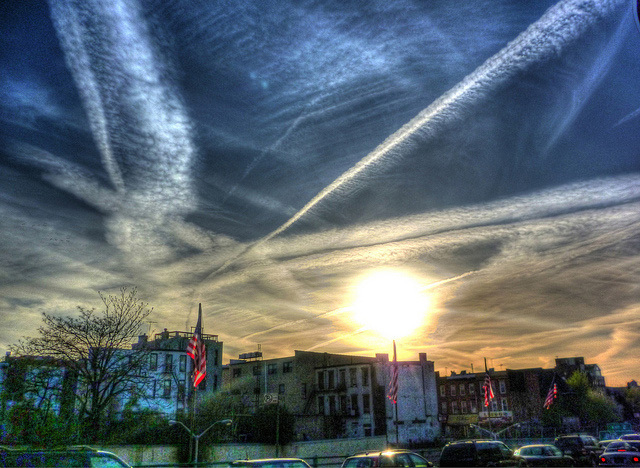 Well, chemical trails contain barium oxide and aluminum oxide, both of which are extremely toxic to the human body. Chemtrails are not “Contrails” (Condensation Trails) which are naturally left behind a plane due to its fuel exhaust. Normal contrails will dissipate within 15-30 seconds after the plane has left that area, so you shouldn’t see it anymore. Chemtrails on the other hand are easily spotted, because they stay behind and appear much larger; sometimes staying in the sky for hours or even the whole day. Remember, these are chemical trails that contain poisons. They were first noticed in 1997, primarily over residential areas. Also, called the thirteen ancient bloodlines and consist of the following: Astor, Bundy, Collins, DuPont, Freeman, Kennedy, Li, Onassis, Reynolds, Rockefeller, Rothschild, Russell, and Van Duyn. They have always ruled this world, and they still do. One of the most infamous families on this list is the Rothschild family, which holds about 80% of the world’s total wealth. They are so rich that this one family has the ability to literally feed, cloth, and settle every man, woman, and child on the planet if they wanted to. Also, if you ever wondered why our taxes are so high and who invented the Federal Reserve and IRS, then please click here to find out more. Also, you may want to search The Bilderberg Group. Also known as America's Most Mysterious Monument or America's Stonehenge. 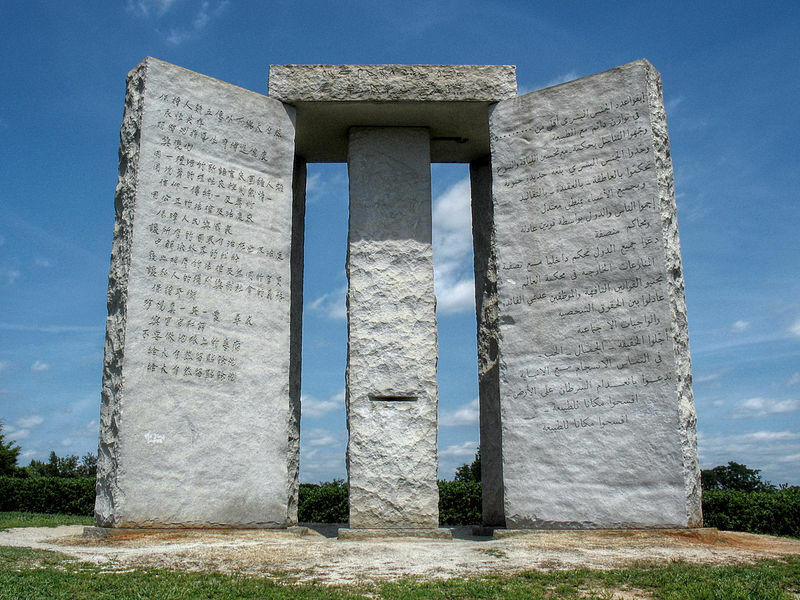 It was erected March 22, 1980, at the request of an unknown person or persons under the pseudonym R. C. Christian (*cough Rosicrucians) hired Elberton Granite Finishing Company to build the structure. Also, the word eugenics goes hand and hand with GMO. Search the company Monsanto and Codex Alimentarius. (and how they’re trying to replace the seeds that grow our food with GMO seeds, by making it illegal for farmers to plant with anything other than the seeds they artificially make). This is where you begin to realize that food is being used as a weapon against us to effectively reduce the world’s population without causing any attention to the efforts. In truth, there have been a number of suppressed cures, but it’s not that uncommonly known since most people have heard about the AIDS cocktail that cures people as long as they have a ton of money… most noticeably, Terrance Howard for example. In fact there is a AIDS U.S. Patent # 5,676,977. Supposedly it cures all blood borne pathogens such as AIDS. Microchips cause cancer, the processed food we eat causes cancer (no coincidence that within the last 50-60 years cancer has become an epidemic amongst Americans, just ask your grandparents if they ever heard of so many people with cancer when they were young). So once again like with AIDS and HIV, there have been several cancer cures (to read about a couple of the different ones, please click here). But, the mainstream will not talk about this stuff. You will not hear it on the news or read it in the paper. An outstanding documentary is called “Run From The Cure” by Rick Simpson. It details how Rick discovered that an extremely small amount of hemp oil can cure almost any cancer in a matter of days or weeks. (also to read about this on Wisdom Square, please click here). “The Beautiful Truth” is another amazing documentary about natural cures to cancer, among other things. 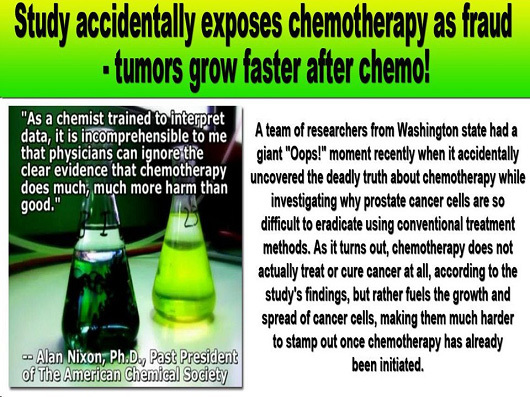 “The Fungus Link” and “The Germ that Causes Cancer” both books written by Doug A. Kaufmann detail exactly how and why cancer is being caused.